I don't see how any reasonable person can read scripture and make any comparison between Jesus Christ and the terrorist and murderous organization of ISIS. Certainly not anyone with a modicum of knowledge of who Jesus is. Yes, we know Pope Francis is pushing a globalist-socialist agenda....but this type of thinking is beyond the pale. If it were simply ignorance, it can be excused. Pope Francis is not an ignorant man, but a man that measures his words. There is more to this than meets the eye. 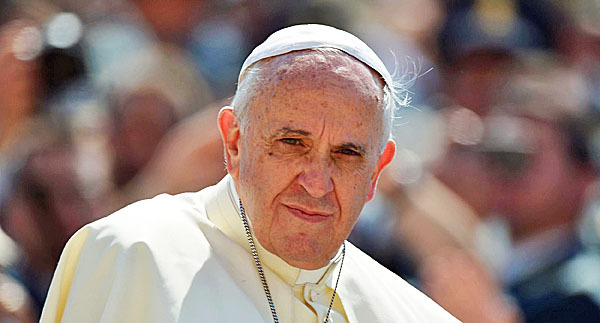 Pope Francis, in an interview with the French newspaper La Croix, suggested a likeness between ISIS and Jesus by explaining that while “the idea of conquest is inherent in the soul of Islam,” it was quite possible to interpret certain passages of the Gospels, particularly in Matthews, as a call for Christians to go forth with this “same idea of conquest” in their discipleship.He also faulted the free market for driving poverty, saying economies need “a state to monitor and balance them;” gun manufacturers for fueling wars; and the failures of Christians in Europe to properly assimilate with Muslims as causing much of the tensions of recent times – ostensibly, to include acts of terror. And he pointed to the many instances he’s personally experienced when Muslims have formed long lines just to attend Christian events. He then underscored his belief that all are equal in God’s eyes, and that all seek the same dignities – and because of this, religion and politics must be kept separate. Francis, who’s been a vocal supporter of the rights of refugees to resettle in Europe and America – and who has outright called on the United States to open doors to more immigrants and refugees – also said “integration” was a key component of ensuring Muslims and Christians peaceably co-exist. He then drifted into a denunciation of capitalism, before returning to “the migrant issue,” and speaking of the need to integrate. But on capitalism and the notion of free markets? First, he called wars the work of “arms manufacturers,” and suggested if that industry did not exist, peace would prevail. Francis then faulted unemployment, particularly in Africa, on the failure of those with the means to invest and provide jobs. And that, he went on, is due to the failures of governments to intercede. Bluntly, he denounced capitalism, calling into question a “world economic system” he claimed had “descended into the idolatry of money,” the newspaper reported.